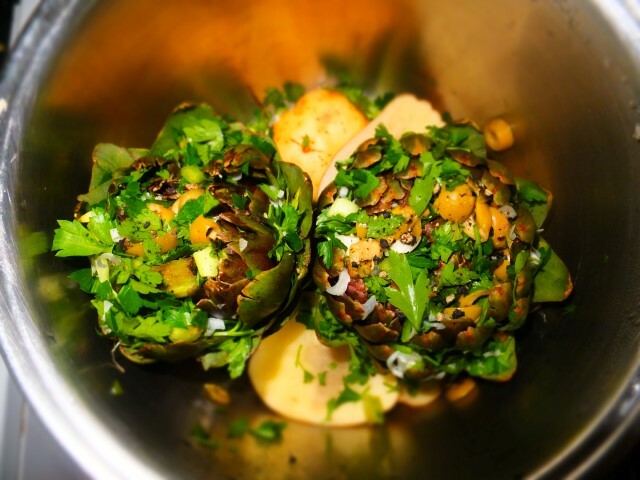 Artichokes are a great winter staple food in our home. This dish is called ‘qaqocc mimli’ in Maltese and while I never found it in restaurants I know a lot of people who cook it here in Malta. These artichokes are also fun to eat as you need to get your hands ‘dirty’. Pull off outer petals at one time. Pull petal through teeth to eat/scrape meaty portion. 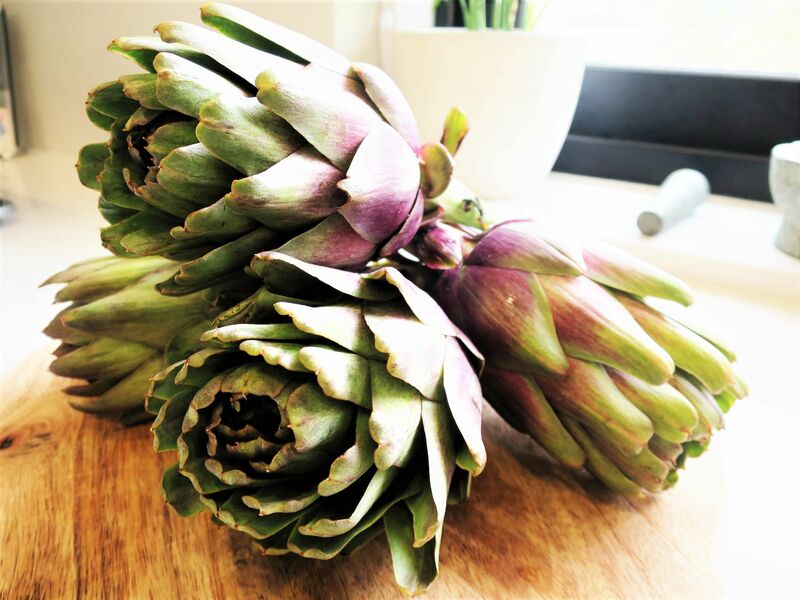 When you are at the artichoke heart remove top spiky part (usually violet) and eat bottom part of the heart. I love the petal’s ‘meat’ and also the artichoke heart. They have different taste but both are delicious. Artichokes are full of nutrients and healthy benefits. They helps irritable bowel syndrome (IBS), kidney problems, anemia, arthritis, bladder infections, liver problems, high cholesterol and lowering blood sugar levels. Raw artichokes before preparing the meal. They have already been pressed against the chopping board to loosen the leafs up. 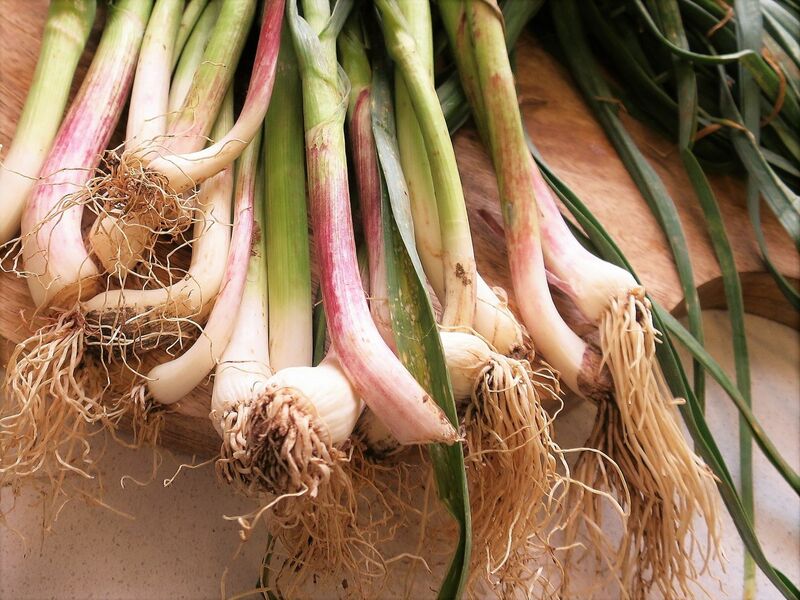 Green garlic, this really makes a difference and is essential for the dish. Enjoy the recipe and shout out if you try it out! Clean the artichokes under running water. While stem is still on, turn the artichokes upside down and hammer on a flat surface or a chopping board. This will allow the leaves to open so that you can easily stuff them. Slice the potatoes in half lengthwise and put at the bottom of a deep cooking pot. In the meantime put a kettle on the boil. Thinly slice the garlic and parsley and mix in a bowl. 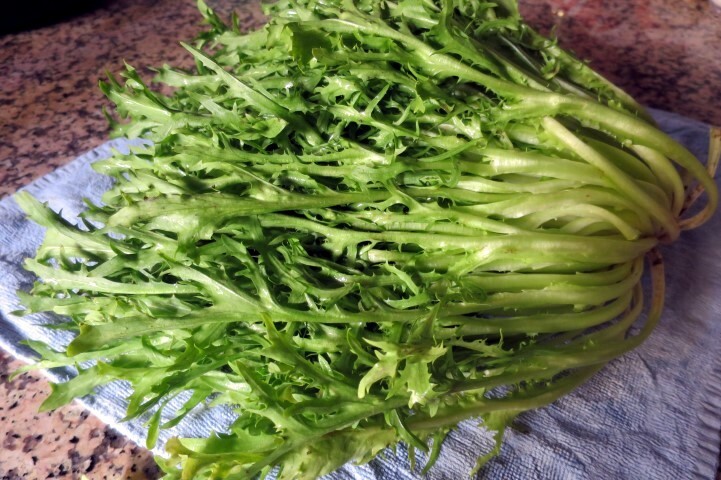 Cut the stem from the artichokes and thinly slice the inside of the stem and mix with garlic and parsley. 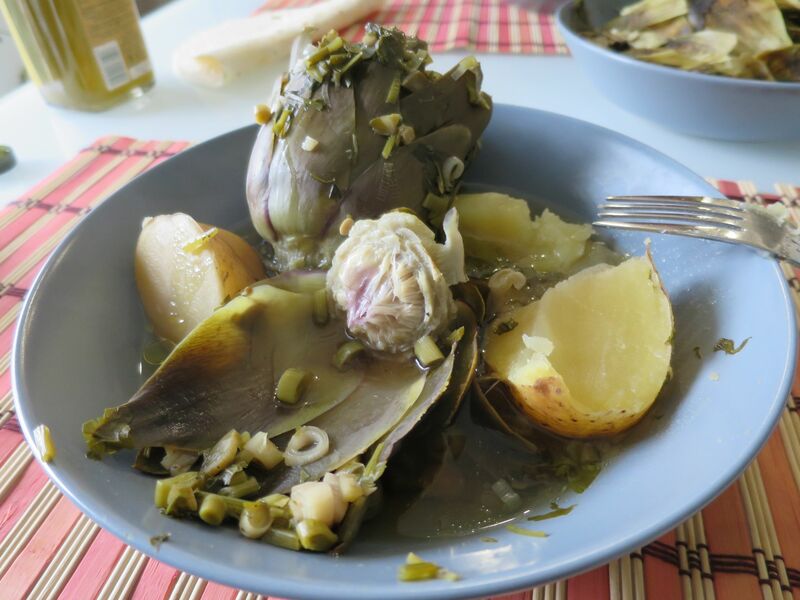 Place the artichokes on the potatoes in the pot and start filling the artichokes with the parsley and garlic mixture. When ready distribute olives inside artichokes and drizzle with salt, pepper and olive oil. Fill the pan with hot water until it reaches half the height of the artichokes. Add the endive on top of the artichokes if using. Cover pot and bring to the boil for about 20 minutes. Then simmer for 100 minutes on low heat (total cooking time is 2 hours). If the water dries out, refill with extra hot water and cover again. The artichokes should be ready after two hours. Test the meat of one petal before switching off the heat. Make sure the "meat" easily comes off when you pull the petal between your teeth, and doesn't stick to your teeth. The longer they cook, the better they taste so patience is an essential ingredient.